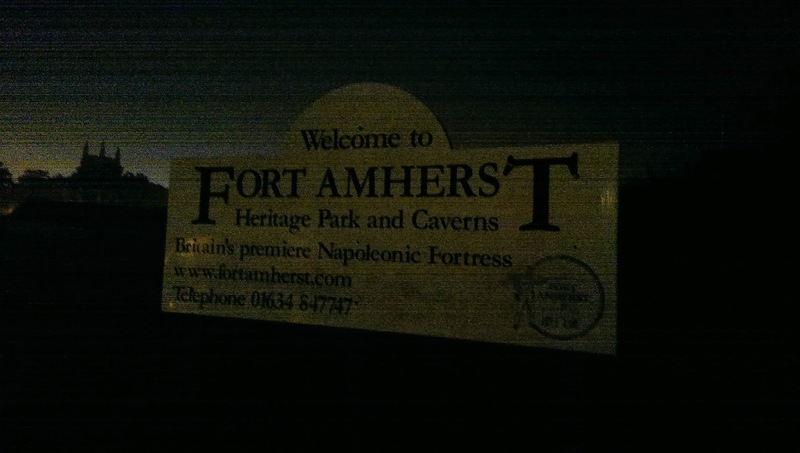 Left foot forward (a journey into reenactment): The Prisoner of Amherst. 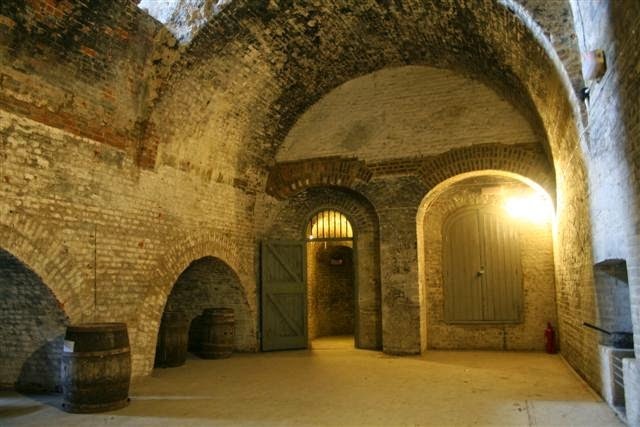 Fort Amherst, Chatham, is the largest Napoleonic fort in England and housed over 3000 souls at its height, built to protect the docks and any invasion force attempting to come up the Medway. Some French (and some American) prisoners were kept there though many more were kept on the prison hulks, condemned ships with no masts where life was harsh and too often short. The Church opposite the fort was built on the site where hundreds of prisoners were buried. Chatham is also associated with the Royal engineers, once a military town, their barracks is the only remaining army base today. 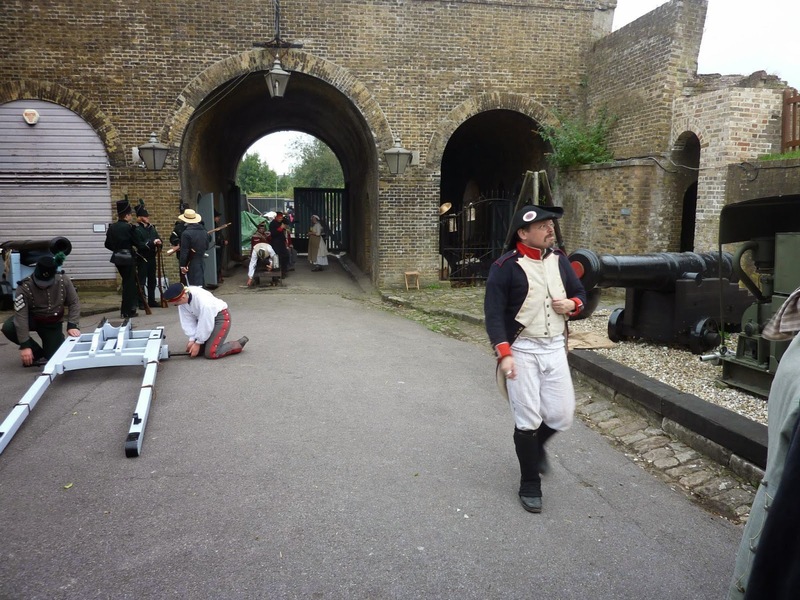 On the weekend of 19/20/21st September the Fort hosted a campaign weekend, garrisoned by British troops whom amongst their usual drilling and garrison duties had to look after a band of French prisoners, whom did they best to be a right pain in the arse. In previous posts I have done a linear account of events, with this I shall instead merely list the number of vignettes and antics witnessed as some of it has become quite a blur, for both Guards and prisoners there was rarely a let up from activity and vigilance..
One of our first tasks as prisoners was pulling out all the cannons and limbers from the artillery shed and then cleaning them. Most of the guards were quite amiable, except rifleman Grumpy, the opposite of Rifleman smiley, so it was amusing when he spent five minutes demanding a prisoner come out of an actually empty shed. This task complete the garrison commander and some British officers wished to see us on parade, which we did, and I was questioned about how we were being treated. Just as the Major was going Sapper stepped forward and said "Excuse me, you might be wanting these. it's the firing pins to your cannon." Poor Corporal Law, whose watch it had been, wished that the earth could have opened up and swallowed him. That night we also managed to steal one of the cannons (which are meant to be regularly accounted for) and conceal it in a tunnel, it remained missing till midday and only then when some clues had been dropped. There is a lot of chalk at Chatham. Come Sunday morning the British woke up to find a lot of daubings. The piece de resistance of this was a four foot bumblebee and the words 'VIVE L'EMPEREUR! written in 3 foot high letters over the main parade ground. It was a joy to behold. Prisoner work that morning was largely scrubbing off chalk. Our main artist, Vince, was later caught with some chalk. As the stern rifleman walked away Vince reached forward to apologise to the man, who tutted, and walked away.. with two perfect white hand prints on the back of his jacket. 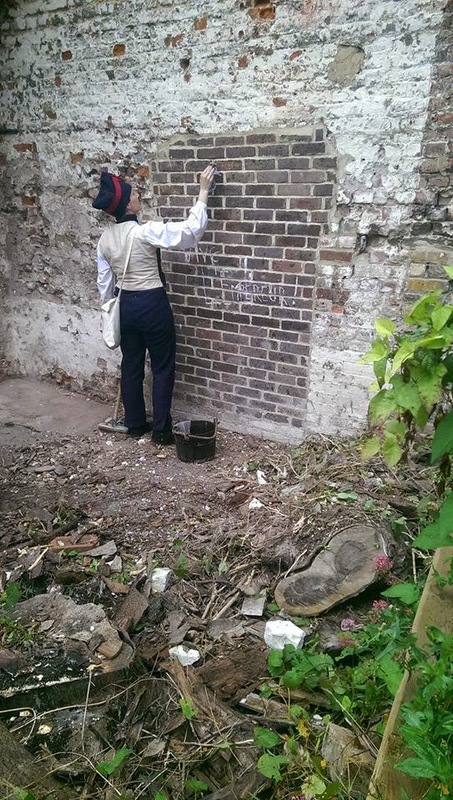 Chalking rifleman was added to the list of sports, along with drinking their tea. Gunner Bob. 'Bob' was a master of sneakiness and escapes, at one point simply walking across the yard (passed guards) and asking some passers by to open the gate before walking off up the road, also a master of disguise as he laid hands on an artillerymans jacket and a Rifles cap and donned the disguise before kneeling, head down, to study a gun carriage, until one of the crew actually stooped down to do up Bobs epaulettes before noticing something was amiss and realisation dawned. 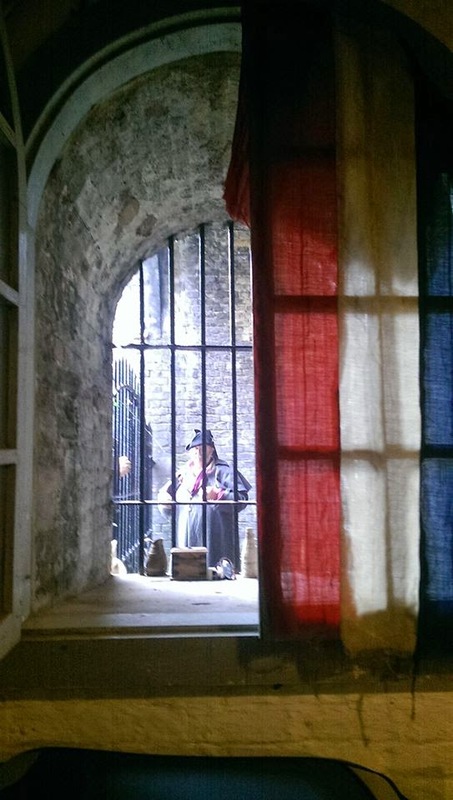 On the Sunday during a brief ad hoc escape (and after being told my parole had been withdrawn after yesterday) I bolted into the top entrance of the British quarters. Other than go further and get caught I stumbled upon the officer's mess and took great joy in sitting in the commanding Officer's chair, eating his cake and using his fine china until the stomp, stomp, stomp of booted feet found me and I had to rejoin my fellows. 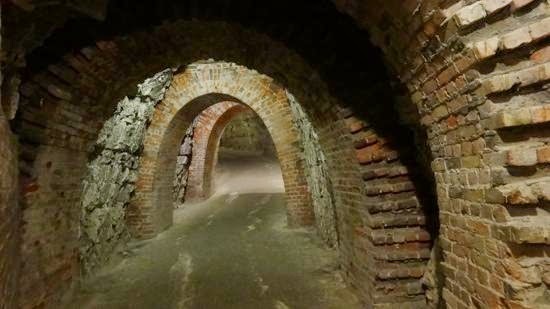 The big escape on the Saturday was set to occur as we exited the top entrance of the tunnel system, on the use of the code word 'Haxo' (French engineer General) we overthrew the guards and tide them up before spitting up. some to make for the escape point and some (including myself) to try and tie up (not literally this time) more guards by disappearing into the tunnels. In vain we searched for a workable exit (without a 20ft drop) and I decided to go up the winding stairs into the pitch black (feeling with my stick) which I hoped would come out on the top gun platform. Alas my fumbling came upon the hatch but it was long since sealed up so I sat and waited, eventually hearing footsteps and my co-escapee, Meg, captured at the bottom of the stairs. in movie fashion the footsteps and voices grew closer and I hoped if I crouched low in the dark they would not see me. closer, closer. Stopped. voices. Then receding footsteps. Had they really gone? I waited longer. More footsteps. keys jingling. What little light I could see below went out. The caretaker was locking up and turning the lights out! Discretion seemed the better part of valour and I got him to let me out. A rifleman near the entrance raised the alarm and I 'fired' at him with my stick, driving him to cover and ran with three more on my heels making it a fair way and diving under a gate until I came to the fort edge/corner, got cludded with a rifle but carried on a bit further before being hemmed in. The scornful sergeant later complained of pains in his ankles from running so much. Turns out I was the last one found and I got a bit of a cheer. Some of the chaps reached the escape point quickly but finding no one there went back on the run. Andy even banging on a gate with his shovel and shouting at some Rifles who knew they couldn't get the gate open until he was heading off in the opposite direction. It was chaos for them. The British suspected we had a gun in our room. They were going to search it (again). Properly. They never found a gun. They found about eight. 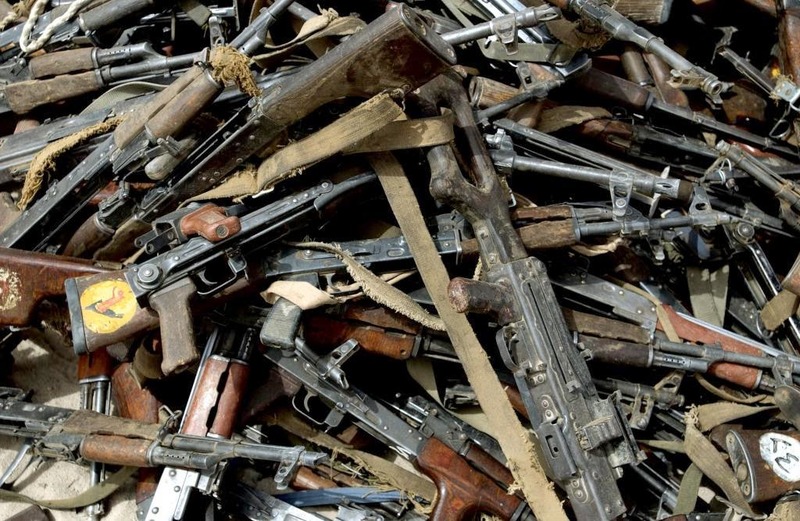 a comedy-eque pile of carbines, pistols, knives and swords, mounting up in the courtyard. More embarrasment and grief for the British, and there were still a couple left! Sundays big escape involved us being delivered some bags of laundry to do by a French sympathiser, amongst which were two full rifle uniforms and a couple of guns. I managed to add a pistol to this that a child (not being subject to discipline) had left in the courtyard and despite three Riflemen being in the vicinity I managed to purloin it and tuck it in the back of my trousers. The habit long being great for hiding things under. We broke out of our lodgings when there were minimal guards, me pulling my pistol on Rifleman smiley whom I gladly didn't have to shoot. Our 'Guards' then escorted us through the kitchens and up the stairs, I managed to add a sword/belt to my attire on the way. At the top the Commanding Officer whose cake I had eaten was in the mess and gave the words 'You shall never take me alive!' before three Frenchmen shrugged 'okay' and shot him. Sadly our escape co-incided with a number of riflemen being on the upper parade ground which cannot be got round. The alarm was raised and a lot of firing and ducking. a Rifleman hurled himself round a corner at me and tried to seise my pistol, we grappled but he got pushed backwards over my knee, seemingly falling in slow motion, at the same moment as i drew my sword in one smooth moment and dispatched him. It was a fabulous moment. We escaped through the cafe to the bemusement of all involved and up the back road to the heights. I hurried on with sword and pistol feeling more like a pirate than the usual line infantryman. This was swash buckling adventure! opposed from both sides we took a good position on a corner that could not be outflanked, Livvy, our eight year old camp girl dutifully knifed a Sergeant behind a tree. I fired my pistol and rolled away on the bank as return fire blossomed and out flanked the rifles, picking one off from the side (after shouting to inform him I was there and was shooting him), but without time to reload my hopes of slipping passed were dashed and I with a sigh of ' C'est le vie!' was back in the bag. Having presented my sword to the rifleman who captured me he graciously gave it back to me on my word of parole. Two minutes later a red faced Sergeant ordered it removed once more and handed over us prisoners to a corporal who promptly returned my sword to me. Two minutes later a red faced British officer came passed and promptly took my sword off me again, despite my protests, I liked that sword. Once again the British were furious. we were locked up properly again. When we were let out onto the yard amidst much pushing and shouting we were told to sit on the low wall. A lot of soldiers with loaded rifles were in a line. Doug said he thought my number was up this time and I paced up and down fully expecting to be shot. I was already psyching up for a goodbye speech but apparently the British army cannot execute anyone on a Sunday. So it was just a telling off. Reflections on the weekend. Firstly, it was great, really memorable. I had been been elected as acting officer as at most events the 45eme out number the Sappers and miners so they attach themselves to us, also because drill and battlefield commands are not so familiar to their role. So they said they should continue to follow the 45e. on this occasion being me. I was glad I packed a nice hat. Fraternising with the NCOs and some officers was good and I overheard several good bits of information, they also overlooked me sometimes in searches (so I didn't have to hide the map they were looking for down my trousers after all) but on the other hand I had to remain dressed up more (Jacket and hat at all times) and let go several opportunities to bunk off on the first day because it wasn't really my place to do so, even though no one had formally taken my parole. Alas my memory for French commands was appalling. Turn right, followed by turn right, was my only way of making the column turn about face. Pointing and shouting became my friend. It was tiring for everyone. Our guards were either working or.. guarding.. with the real threat of us trying something, even just stealing a knife from the kitchen or disappearing round a corner, or plotting, meant they had to genuinely stay on their toes. Im sure there were further antics not listed here, when nor working, shirking or actually escaping, it was watching them, watching us. Friends were made. One of our lovely yet most effective guards had been a school teacher for thirty years and claimed looking after us was just like being on a field trip with a class of ten year olds. He rarely missed a trick. The 3rd battalion was a lot more easy going and there NCOs more cordial than the !st (?) with their gruff Sergeant (everyone likes him really!) when they took over on Sunday morning their was a lot of cursing all round, although to be fair they knew what the other lot had been put through and were fore warned. 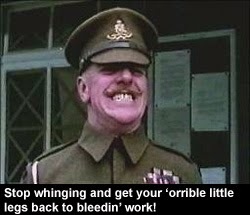 The Sgt even took away my stick, although it was twice returned by an artillerymen I asked to get it, and confiscated again. I liked that stick. After Sundays big escapade there was a nod, nod agreement that we (really) wouldn't be escaping again although there was still some work to do, a collective sigh and slumping of shoulders went through the fort. 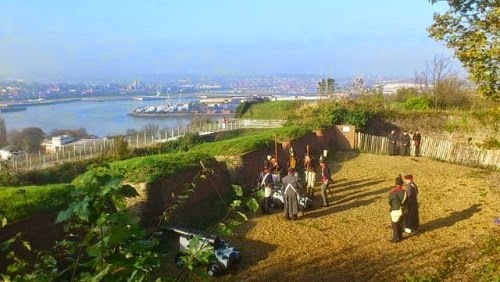 The fort flag was lowered late afternoon and a short speech given by Tony, who had organised the event and himself was worthy of much praise for his efforts. Packing away commenced. Later some of us sat and recalled some of the weekends shenanigans with much laughter, and I still catch myself smiling when I think of many of them. There is some promise of something similar being done again next year, I definitely won't be missing that one.